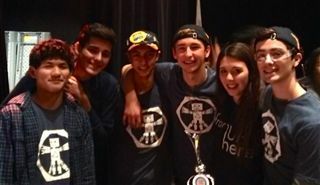 Last weekend, Upper School robotics team "4373 Firebots" qualified for the San Diego Regional FTC Robotics Championships. According to robotics program advisor Mr. Park, the team demonstrated gracious professionalism and expert driving throughout the day of competition. According to robotics program advisor Mr. Park, the team demonstrated gracious professionalism and expert driving throughout the day of competition. The fourteen Firebots team members will compete at the next level in February 2015. Kudos also go to members of the freshman team "9266 PyroBots" for a solid finish in their first outing at a qualifying tournament.